My smallest WordPress theme has received a big styling option (relatively speaking, at least). One of the new features in my latest WordPress theme, Hamilton, is a Dark Mode. When the Dark Mode theme option is activated in the WordPress customizer, the theme changes from dark text on a white background to white text on a dark background. Since Davis is mostly monochrome, just like Hamilton, I figured the feature would be a nice addition there as well. 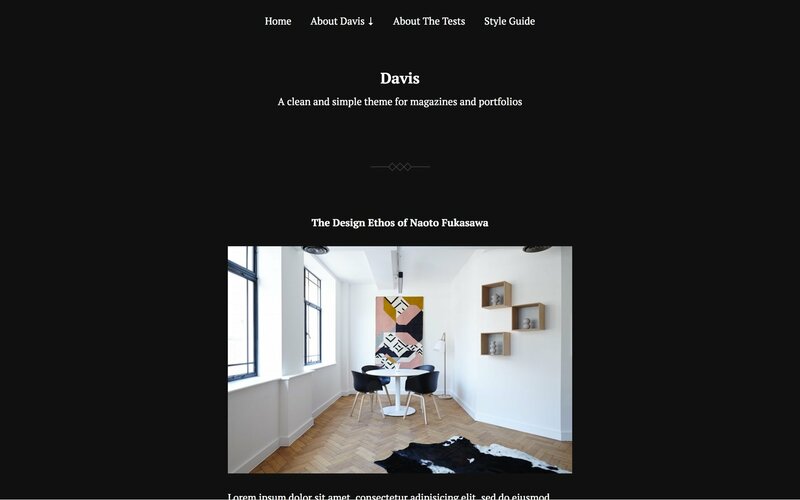 Davis running with Dark Mode activated. If you’re already using Davis, you can upgrade to the latest version (1.08) through the Upgrade screen in your WordPress administration panel. If you’re not using Davis and want to check it out, you can read more about it here. Dark Mode is activated in Appearance > Customize, in the Colors panel in the sidebar.